What’s a forty-year-old virgin doing in a predicament like this? Looking for a husband because her late father’s will decrees she must marry or forfeit her orchard, her only means of support. 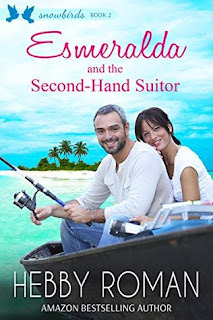 Hank McCall, as a perspective husband, leaves a great deal to be desired—he’s twice divorced and older than Esmeralda. Scarred by their pasts and challenged by the gap in their ages, Esmeralda and Hank struggle with their new-found relationship. But when Hank is faced with losing Esmeralda or surrendering to her yearning to have a real family, their fates hang in the balance. Esmeralda and the Second-Hand Suitor was a cute story. At times a little unbelievable, but other times incredibly down to earth. It was also quite refreshing to see an older couple portrayed as....asn older couple. I know, crazy right? Esmeralda and Hank are both over 40 and living real life with real life problems. Divorce, paying bills, meeting people, family drama, and wondering if it's even worth looking anymore. Esmeralda was a bit on the unbelievable side for me. A little too much of her character seemed to be determined by what would help the story work better. She's a virgin - which I know can still happen - but let's be honest. It isn't very likely anymore. She can only have her inheritance if she's married - because her father is a chauvanistic jerk - which I am more inclined to believe, but it still seems far-fetched. Especially to have all these things fall on one person's shoulders. Hank is a divorced, fighting to keep enough from his recent ex so that he can retire in peace, and is really and truly going through what seems to be a mid-life crisis. Flying south to spend some time away from it all, he meets Esmerelda, and they are both faced with some serious adult-like problems (such a refreshing prospect). This book dealt with real-life people facing real-life issues that would (mostly) affect any one of us that is no longer hovering in that 20-something age group. I really enjoyed seeing an older couple than I usually see in a romance with experiences and personalities that fit them well.